Get Sh*t Done! is a participatory session aimed at providing young professionals with useful and concrete support in understanding the power of digital and marketing principles for social change in Nigeria. Today like never before, young Nigerians are exposed to foreign norms and standards conflicting with their own reality. This generation we call millennial aspires to create new solutions, challenge traditional beliefs, have a new way to understand adulthood, gender role, success and overcome social pressure. Get Sh!t Done! 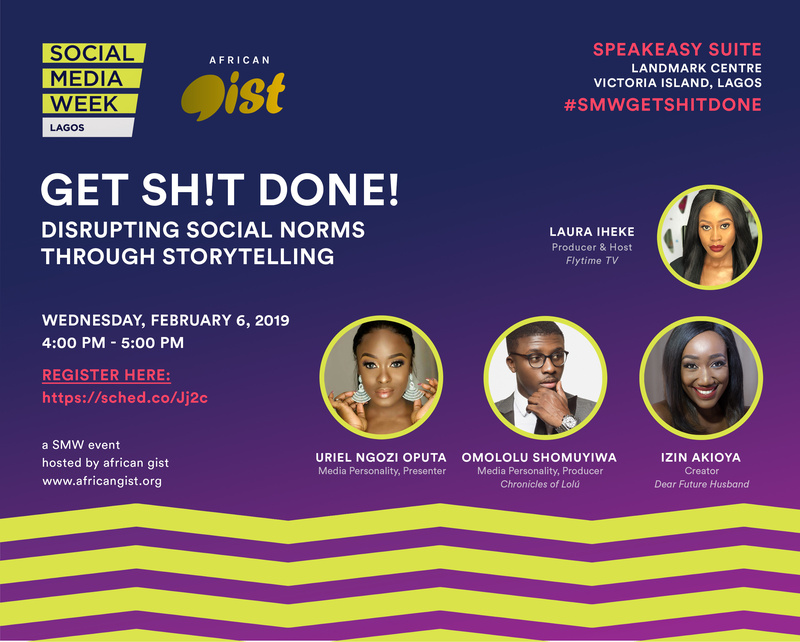 Disrupting Social Norms Through Storytelling will focus on storytelling and the power of influencer marketing to disrupt traditional norms and drive social change in Nigeria. How can one's story inspire others to do more and drive real change within society? What does it take to make these stories visible and create a community of young changemakers? For this speakeasy, we will invite Nigeria's top changemakers using digital platforms and storytelling to disrupt traditional norms, share their stories, and drive social change in their communities.